At this time in humanity’s development many people are experiencing dislocation and confusion about their roles in society, their family and even themselves. To them it may appear that their former roles, values, and relationships are no longer valid. They question the purpose of their lives and everything that once had meaning for them. What I am discussing is far more than a mid-life crisis, for it may occur at any age from a teenager to a senior citizen. This process may commence suddenly with the onset of a life threatening illness, or it may be a gradual disenchantment with society’s values by someone who “has it all.” Individuals may be uninterested in spiritual topics and still encounter this process because all people are spiritual just as they are physical, emotional, mental, whether they are consciously aware of it or not. Therefore, this experience may arise both in the life of someone who meditates and does spiritual practices, or with someone who does not. It is not our personality, our lower self, which decides the timing of our awakening but our higher self, our soul. If you are undergoing a spiritual transformation it might feel as if you are losing control of your life, and perhaps even questioning your identity. This feeling, however, is just your personality’s fear of losing control. In actuality it is an indication of strength and spiritual and emotional maturity when a person undergoes this spiritual crisis. References to this process are found in many religions and cultures. In the old testament of the Bible it is referred to as the dark night of the soul. The twenty-third psalm speaks of this journey as going through the valley of the shadow of death. In ancient Greece, Egypt, India and other cultures there were schools of wisdom which helped individuals through this process. These individuals were taken into seclusion and taught what was referred to as the inner mysteries, which are the spiritual truths on which our world is founded. “Is it necessary to undergo a spiritual transformation, you might ask?” Yes, it is because the purpose of this transformation is to become a conscious Creator on this planet in accordance with divine will. In our western world there is little support for people to undergo this spiritual transformation. Very few people enjoy the luxury of quitting their jobs and going to India for the rest of their life to meditate. Nor is this necessary. None of us are given more than we can handle. We are set up to succeed in this transformation and not to fail. This means that if we are married, have children, have a nine to five job that we can do this and still succeed at our spiritual transformation. This is likewise true even if we are divorced, do not get on with our children, and have just been fired from our job. Each of us is given just what is needed to assist us with our transformation. If we are to become conscious Creators we need to do this on three levels, which is to transform ourselves, transform our work, and transform our world. This process of spiritual transformation entails a commitment to world service even if you do this in your own family. To achieve this goal we must first transform ourselves so that our fears, attachments and self-interest do not sabotage our effectiveness in our work in the world. We affect others not just by what we do, but by who we are as human beings. The more we purify ourselves the greater our positive impact on others by our very presence. 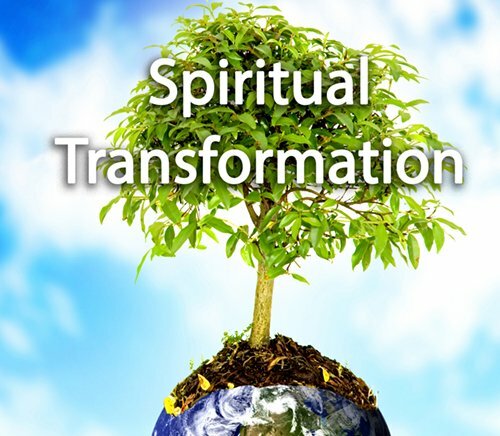 The numbers of people undergoing this spiritual transformation are increasing daily. This is obvious from the chronic low grade depression we sense in people around the world. It does not make sense that people in the developed world who have fine homes, jobs, cars and the opportunity to buy most anything they wish would feel depressed – unless another reason for their depression exists aside from satisfying their material needs. A soul hunger is emerging in people in the western world who have strengthened their personality and fed it everything it wishes. No amount of possessions, relationships, or status will fill this hunger. Our commitment to serve others above serving ourselves will be tested throughout the spiritual transformation process until we can say that our foremost goal is to serve the divine will on Earth. It is still possible to lead an ordinary life with family and career, but now our major concern is no longer with money, status, and security, but rather with a desire to assist others in some way. Our commitment to make a difference to others and the world fills our life with joy and love. To succeed in this process of initiation we need to have a deep level of trust in the divine‹whether we call it God or the Creator‹to look after us. We also must trust ourselves that we are up to the challenge. When we trust and surrender to the greater good, we open our hearts in a deeper way than was possible previously. Through our trust a profound opening occurs in our hearts. It is an almost magical experience. We find ourselves in a brand new place, which we might have consciously or perhaps unconsciously yearned for. It’s a place of peace, of compassion and of acceptance for ourselves, for others and for all life. And all that is required to arrive in this place is a deep surrender to trust that we will be safe. That we are loved and cherished. That we are the young brothers and sisters of those who have gone before and who are wayshowers ahead of us on the path. That our Universe is a continuous stage of growth, a conscious creation. That the Earth is evolving, that the planets are evolving, that the Sun is evolving, that God is evolving and that we are part of this continual state of evolving into consciousness. We cannot help but evolve, and the only way that we ever hinder our evolution is to keep ourselves closed. And what closes us? Fear is what closes us. Fear that we will not have enough; fear that we will not be looked after; fear that we will not be loved; fear that we will not be smart enough. Fear that we will undergo a scarcity of something, that we will not receive whatever the goodies are that others are getting. Fear combined with lack of trust in the divine makes it difficult to commit to doing the divine will. Fear shuts down the flow of energy from the higher spiritual realms and impedes the entire process of spiritual transformation. Spiritual transformation occurs more quickly when we work with like-minded individuals who are going through the same process. This is the power of 1+1=3. The benefits in being a member of a dedicated spiritual transformation group are enormous. Each member multiplies the effects that the group has on each other, and in the world. This greatly increases the strength of the group in manifesting their goals, and decreases the time that this takes. Naturally each of us has preferences to overcome and the other group members act as role models in how to overcome these. For example, some of us love God unconditionally, but we are not quite sure about our fellow human beings. Others might love animals, but we are not so sure about humans. Others might love our families, but we are not quite sure about men. Ultimately we must learn to love all equally and through our fellow group members we learn to do this. One of the reasons that so many humans are undergoing their spiritual transformation at this time is that the Earth is as well. We are only one of billions of species evolving on the Earth, and anything that affects the Earth affects us. The Earth is a living Being and it is becoming a conscious planet at the same time as humans are becoming conscious creators. This process will be accomplished during the next two thousand years, which is known as the Aquarian Age. The astrological symbol of the Aquarian Age is the enlightened human, the water bearer who pours the water of life on the Earth. This is the sign of the conscious human who is dedicated to world service, the human who has gone through their spiritual transformation. During this next two thousand years, humans and the Earth will become conscious partners in working for the betterment of all life on this planet. Presently, the Earth is holding back its own evolution for us, and it is surrounded by what is called a ring-pass-not. This ring is like a shell which encases the Earth and separates it from all the other conscious planets in our solar system. This shell is now cracking and new energies are entering from more conscious planets in our solar system and from other solar systems, which are more highly evolved than ours. These energies have never existed on our planet before and are greatly accelerating the development of consciousness on this planet. The ring-pass-not that separates the Earth from other conscious planets is cracking like the shell around an egg when the little chicken is ready to be birthed. These cracks put a strain on all of the Earth’s systems which can mean increased volcanic activity, earthquakes and climate changes. The Earth is moving to a higher vibration and all beings on its surface must do so as well. As with the Earth, we humans have a shell that surrounds us until we undergo our spiritual transformation. This shell is composed of our physical, etheric, emotional and mental bodies that form our personality vessel. When our personality is mature‹as with the chick in its shell‹the vessel will crack. The cracking is what we associate with the dark night of the soul when we feel that we are no one, doing nothing, going no where. This cracking is necessary so that our soul can merge with our personality. Through this process we become what’s called a soul-infused personality. This means that our soul works through our personality to serve in the world. The major thrust in human evolution during the next two thousand years is for people to become soul-infused personalities through their own spiritual transformation. Tanis Helliwell M.ED, is the founder of the International Institute for Transformation whose mission is to help people live and work with meaning and purpose. She is the author of Hybrids, Manifest Your Soul’s Purpose, Decoding Destiny: keys to mankind’s spiritual evolution, Summer With the Leprechauns: The authorized edition, Pilgrimage with the Leprechauns, and Embraced by Love. Her books are available at our Bookstore, or on Amazon.com.